A collection of recently discovered photographic images tells the story of Pennsylvania's lumber heyday and a transformed landscape throughout the state’s Northern Tier. Images of denuded hillsides stick out in stark black and white; in other photographs, the thick forest nearly envelopes the camera, as men, shirt sleeves rolled up past their elbows, stand in eerie stillness. These photos may have never seen the light of day if not for the curiosity of a woman in Upstate New York and the dedicated research of Ronald Ostman and Harry Littell, co-authors of Wood Hicks and Bark Peelers: The Photographic Legacy of William T. Clarke (published by Penn State University Press in collaboration with the Lumber Heritage Region of Pennsylvania and the Pennsylvania Historical and Museum Commission, 2016). William T. Clarke's photos were first uncovered in the 1970s as Lois Barden sifted through items stored in a shed on property owned by a relative. Barden uncovered a box of glass negatives—thinking at first they were simple panes of glass. But when she held them to the light, and blew off some dust, she saw ghostly faces staring back at her. Eventually Barden took a photography class from Littell, a professor near Ithaca, New York, and mentioned the glass negatives. Turns out the estate was owned by one of Clarke’s nieces and his negatives were stored there. Using a computer, Littell scanned the negatives, and a narrative of sorts came into view. The photos were clearly from the late 19th century, based on the technology and composition. 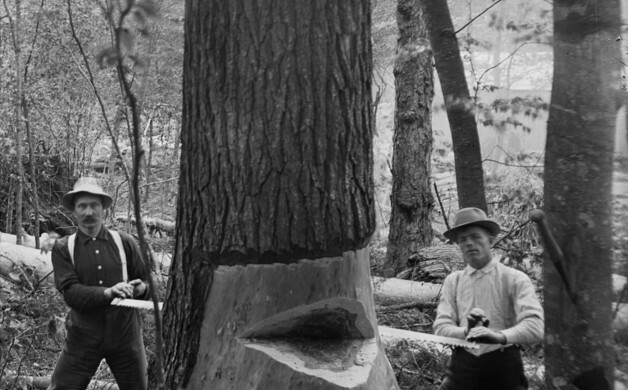 They showed life around lumber camps, and the work it took to fell massive trees before the era of mechanization. Littell reached out to his colleague, Ostman, a Cornell University professor with whom he had co-authored several books and they applied for a research grant to learn more about the images and the photographer. Their research took them to Potter County, where they visited a historical society and the Pennsylvania Lumber Museum; and then eventually to the Pennsylvania State Archives. 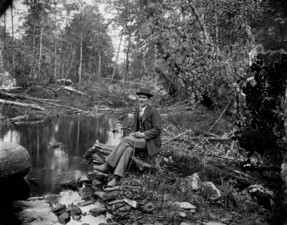 A few surviving photos taken by Clarke were enough for Ostman and Littell to determine that he was the photographer behind the rediscovered images. In this era of digital photos and selfie sticks, the art and technique behind Clarke’s photos is striking. Each photo took several seconds of exposure—due to the sensitivity of the plates—and the negatives would have been developed on site. While Ostman and Littell were able to determine that Clarke was the photographer, they uncovered little about him. But, looking back through the lens of history, Clarke captured an important moment in the history of Pennsylvania. The men who toiled in the remote woods of Pennsylvania were mostly immigrants—or nearby farmers—looking for work. 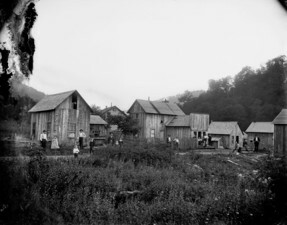 The housing boom of the late 19th century pushed logging companies into remote stretches of the Keystone State, with lumber camps sprouting up at the end of rail spurs, Ostman said. For six days a week, the men worked from dawn to dusk, felling trees, stripping bark and hauling the trees to staging areas for transport. Most of the work occurred between October and July, as the cold weather froze up the ground, making the hauling of massive trees easier, Ostman said. Around the Fourth of July, the lumber camps would empty out, with the men descending on nearby towns. 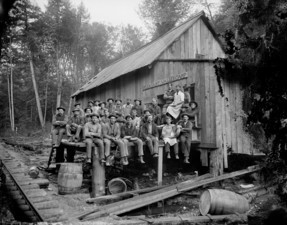 Eventually the demand for lumber faded, and with it the jobs and small communities that sprang up on the lumber lines. Left behind were forests devoid of tree cover, with nearly 5 million acres of trees taken. In part, the conservation ethos that took over in Pennsylvania at the turn of the 20th century has its roots in the clear cutting of the woods, Ostman said. Foresters gained a greater understanding of the role that trees played in water quality and erosion control. On areas where hemlock trees once grew, a new forest took over—dominated by cherry, oak and maple trees. That regeneration has led to Pennsylvania’s stature as a leader in hardwood production. That regrowth is due to Mother Nature, and foresighted conservationists, Ostman said. Darrin Youker writes from his home in Adams County.